A keloid is an extra growth of scar tissue over a skin wound. It grows beyond the margins of the skin wound. A keloid can be thick and differ in size from small to large. They are not harmful to overall health. Scar tissue is a part of the normal healing process. It grows in an uncontrolled manner. Even if the wound is covered, the scar will grow. The growth can last for weeks or months. Keloids are more common in people who are Black, Asian, or Hispanic. They are also more likely in people who are aged 10-30 years old. Keloids often begin as small lumps at the site of a skin injury. They gradually grow beyond the edges of the wound. The doctor will ask about your symptoms and health history. Your answers and a physical exam may point to a keloid. Tests are rarely needed. Some keloids may go away on their own, but this is rare. Keloids don’t need care unless they bother you. Care for a large or bothersome keloid may involve surgery, lasers, or shots. Corticosteroid shots—Often given with surgery. This is repeated every 3 to 4 weeks for 6 months. Steroids can ease itching and pain. They also slow scar development and cause some shrinking of the keloid in some people. Medicine may be injected into the area or applied as a cream after the surgery. Silicone gel sheets—A special material creates a watertight seal over the scar for an extended period of time. The silicone creates a moist, ideal environment for the skin to heal while keeping out bacteria and dirt that may worsen scarring. Skin hydration (including topical moisturizer) and sunscreen. Radiation therapy after surgery. This may be limited as an option because it is toxic to healthy tissue. Take steps to protect your skin from trauma. Care for cuts or scrapes right away. Do not tattoo or pierce your ears or other areas of the body. Keloids. American Academy of Dermatology website. Available at: https://www.aad.org/public/diseases/bumps-and-growths/keloids. Accessed June 20, 2018. Keloid and hypertrophic scar. EBSCO DynaMed Plus website. Available at: https://www.dynamed.com/topics/dmp~AN~T114293/Keloid-and-hypertrophic-scar . Updated April 6, 2016. Accessed June 20, 2018. Manca G, Pandolfi P, Gregorelli C, Cadossi M, de Terlizzi F. Treatment of keloids and hypertrophic scars with bleomycin and electroporation. Plast Reconstr Surg. 2013;132(4):621e-630e. O'Brien L, Jones DJ. 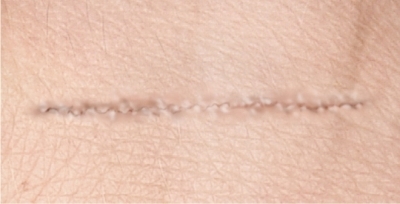 Silicone gel sheeting for preventing and treating hypertrophic and keloid scars. Cochrane Database Syst Rev. 2013;(9):CD003826. Scar revision. American Society of Plastic Surgeons website. Available at: https://www.plasticsurgery.org/reconstructive-procedures/scar-revision. Accessed June 20, 2018. Shaffer JJ, Taylor SC, Cook-Bolden F. Keloidal scars: A review with a critical look at therapeutic options. J Am Acad Dermatol. 2002;46(2 Suppl Understanding):S63-S97.